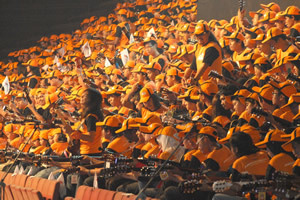 BANGI, 23 Nov 2010 – Music lovers and guitar enthusiasts should make a date at Stadium Putra in Bukit Jalil this Thursday where they can have the chance to listen to songs from 1,000 guitars, courtesy of the UKM’s Cultural Centre. 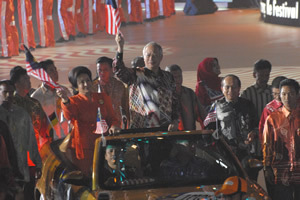 Billed as the largest guitar performance, the night of 1,000 guitars is also making a bid for the Malaysia Book of Records, to be witnessed and verified by Prime Minister Dato’ Sri Mohd Najib Tun Razak, who will also inaugurate the event. 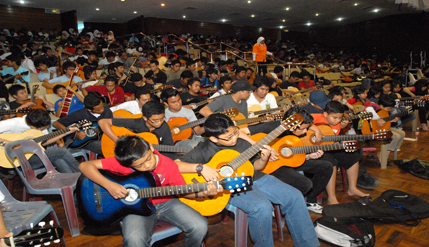 UKM’s Cultural Officer, Encik Amar Baharudin Malaysia (UKM), said the university is responsible for bringing together these guitarists to train under one roof for the performance. “We have guitarists as young as eight years and as old as in their 60s,” he said, noting that the majority of them have their own instruments. Those who do not, have to borrow from the university. The guitarists come from different public and private universities, colleges and schools from as far as Perak and they are presently housed at UKM where they are rehearsing to play two songs – “Malaysia Inovatif” arranged by Dato’ Dr Johari Salleh, Senior Fellow at the Centre for Students’ Advancement and “UKM Seribu Guitar” by Encik Mohamad Adzan Mohd Fadzil, a cultural officer of the Centre. The 1,000 guitar performance is one of the highlights of the Malaysian Innovation Festival 2010 (Festival Malaysia Inovatif 2010) organised by the Ministry of Science, Technology and Innovation (MOSTI) from 24 to 26 November 2010. Other attractions are dances, songs and performances by leading bands like X.P.D.C, Kristal and Hujan. Entrance is free for the performance starting from 8.30pm.